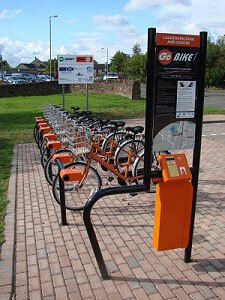 Congratulations to Dumfries for becoming the first town in Scotland to start a Public, easy accessible, and user friendly Bike Hire Scheme – Bike2 Go. The initiative is looking to promote fitness and greener travel in and around the town and it certainly looks like a great opportunity for locals and visitors alike. The bikes will initially be available at various key locations throughout the town and surrounding areas including the Railway Station and the DG1 leisure centre (both less than 5 minutes walk from Glenaldor House). Hiring seems to be very easy and can be done through the internet or by simply calling 01387 280042 with your credit / debit card details. You will be given a customer ID and pin number which you can then use to release your bike from any of the hire a bike hub locations, another good idea is that when you are finished you can then leave your bike at any of the other key designated areas. In terms of residents of Dumfries research has shown that 68% of journeys in the town are less than 5 miles making the bike2 go initiative a viable alternative for lots of locals to use a bike for some of their journeys. For the visitors to Dumfries we have an extensive traffic free cycle network, connecting many of the town’s key locations, therefore it seems like an ideal way to get out and about to explore the town. The cost for visitors also seems very reasonable at £10.00 for a day ticket (with discount for more than 1 bike) and £6.00 for a half day ticket. Well done Dumfries for the forward thinking and here’s hoping that both locals and visitors use the bikes regularly to ensure the scheme enjoys the success it deserves. If you need further info on the scheme please visit www.gosmartdumfries.org.uk/bike2go or feel free to contact me at [email protected] if I can help with further info.